“In high school I wanted to become a teacher… until I took accounting. I loved math and accounting and never looked back. I took the CPA track at Utica College and started at Gustafson two weeks after graduation in 1989. 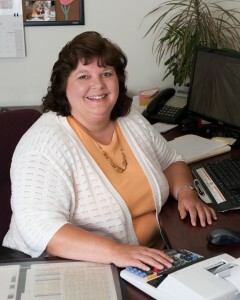 Julie started her career in accounting immediately after graduating from Utica College with a Bachelor of Science degree in May of 1989. She started with Gustafson & Co. in the same month and has been with the firm ever since. She obtained her CPA in 1993 and today is partner at the Canastota office specializing in tax for business, individuals, estates, and trusts. Julie and her daughter live in Oneida Castle. She’s Treasurer of the Clayville Library Association, member and past-president of the Mohawk Valley Business Women’s Network, and Church Council President and Worship Committee Chair at St. Peter’s Lutheran Church. She’s fond of reading novels, mostly mysteries, science fiction/fantasy and political intrigue. Save time and money with tips, business advice, and updates on tax law that may affect you. It’s easy, sign up today for our newsletter. Copyright © 2019 Gustafson & Wargo, CPAs, Tax Accounting. All Rights Reserved.